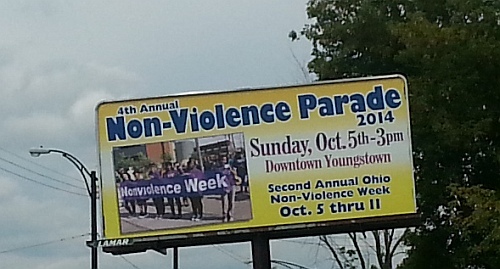 The Fourth Annual Nonviolence Parade/Rally will be on Sunday, October 5, 2014. Jeff Steinberg, director of Sojourn to the Past, and Minnijean Brown Trickey, one of the Little Rock Nine will be in Youngstown on October 5th for the Nonviolence Parade. On Monday at 8AM, Mr. Steinberg and Ms. Trickey will be speaking to East High School students. They will be at Chaney High School in the afternoon. At 8AM on Tuesday morning, they will be at Youngstown State University to speak to Early College students. At 6PM on Monday evening, October 6th at the Tyler Historical Center, Minijean Brown Trickey, one of the Little Rock Nine, and Jeff Steinberg, director of Sojourn to the Past, from San Mateo, California, will be speaking on the topic of NONVIOLENCE. The public is invited to attend. At 6PM on Tuesday, October 7th a town hall meeting will be held at Choffin Career Center with satellite sites around the city to discuss the topic of “Helping Youth Stop Violence”. Panelists will include Minijean Brown Trickey, Mayor John McNally and Police Chief Robin Lees.